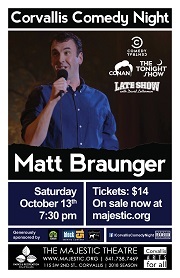 Even if you’ve never seen Matt Braunger, you’ve seen Matt Braunger. Whether it was as a stand-up on The Tonight Show, an actor on NBC’s Up All Night, a panelist on Chelsea Lately, or a cast member on MADtv, he’s been one of the most ubiquitous and unique comedians of the past decade. Although he grew up in Portland, Matt began his stand-up career in the (soon to be) legendary mid-2000s Chicago comedy scene which also launched Kumail Nanjiani, Hannibal Buress and Cameron Esposito. Since moving to Los Angeles to chase the dream, Matt has recorded stand-up specials for Comedy Central and Netflix, appeared on countless TV shows, and become one of the most consistently entertaining, enjoyable stand-ups working today. We can’t wait to welcome him back to Oregon for Corvallis Comedy Night. Refunds will only be applied for canceled performances.